The southwest arm of Sulawesi embraced three related peoples active as seafarers, the Makasarese in the southwest, the Mandarese in the northwest, and Bugis, the most numerous, occupying most of the remainder of the peninsula. These people shared a similar written script and a highly pluralistic political system in which local authorities were anchored in supernaturally endowed regalia (arajang) and descent from a variety of mythical ancestors, each separately descended from heaven (tomanurung). In the period 1600-1669 the city of Makasar and its Goa-Tallo ruling dynasties dominated the region politically and economically. Resentful Bugis of the Bone kingdom therefore allied with the VOC to destroy Makasar in 1669. This event had at least two consequences. First, Bone became the most important kingdom in southwest Sulawesi until the 19th century. Second, it led to the Bugis Diaspora, particularly of the men of commercial-minded Wajo, which had been allied with Makasarese Goa rather than Bugis Bone in the war. 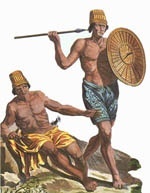 The Bugis became noted both as effective warriors and enterprising traders throughout the Archipelago. Two Bugis warriors achieved fame during the troubled years of Mataram, the principal Javanese kingdom of the 17th century. First, Aru Palakka, the King of Bone and an ally of the Dutch during its war with Makasar in the 1660s, assisted the Dutch in their involvement in Javanese politics and the affairs of Sultan Amangkurat I. Second, Karaeng (Prince) Galesong, one of the warriors of Makasar and an enemy of Aru Palakka, assisted the rival of Amangkurat I, Prince Trunajaya from Madura. In 1675 Karaeng Galesong built his headquarters in Pasuruan (Eastern Java). Until his death around 1679, Galesong and his men roamed the north coast of Java assisting the Madurese warriors of Trunajaya. On many occasions they fought against Palakka and the Ambonese warriors of the VOC led by Kapitan Jonker. Another group of Bugis migrated to the Riau Archipelago (Straits of Malacca), headquarters of the Sultan of Johor since the mid 17th century. In 1679 a Bugis warrior, Daeng Mangika, and his men offered their assistance to the fugitive king, Ibrahim. From that time on the Bugis became involved in the politics of the kingdoms of the Malay peninsula. Daeng Parani, another warrior, succeeded in making himself viceroy (Yangdipertuan Muda) of Sultan Abdul Jalil of Johor at Riau in 1722. Up until the end of the 18th century Bugis warriors were always appointed as viceroys of Johor. Daeng Parani was followed by his younger brother Daeng Marewah. Another relative, Daeng Chelah, whose son Raja Luma was appointed Sultan of Selangor, succeeded his uncle at Riau, followed by Daeng Kamboja. The last Bugis viceroy in Johor was a nephew of Daeng Kamboja, Raja Haji. From their headquarters in Riau the Bugis expanded their influence to a number of kingdoms on the peninsula. From time to time they controlled the tin kingdoms of Perak and Kedah. In the kingdom of Selangor they were unchallenged and eventually became kings themselves, starting with Raja Luma. Their economic base in the peninsula was the export of tin. The political pattern began to change in the mid 18th century when Sultan Sulaeman of Johor allied himself with the Dutch at Malacca. By promising concessions on the tin mines to the Dutch, Sulaeman used them to balance the power of the Bugis. Daeng Kamboja was then forced to move from Riau to Linggi. The Bugis risked all in an attack on Dutch Malacca in 1756, but were badly defeated. Two years later three Bugis leaders, Daeng Kamboja from Linggi, Raja Tua from Klang and Raja Abdul from Rembau, tried to make their peace with the Dutch and Sultan Sulaeman. Raja Haji, the successor of Daeng Kamboja, tried every means to uphold Bugis power in the Straits, even murdering Sulaeman. In 1784 a large fleet was sent from the Netherlands under Admiral van Braam, defeating and killing Raja Haji of Malacca. From then on the political influence of the Bugis on the peninsula declined, though their position in Selangor continued. Many nobles of the kingdom today trace their ancestry back to the Bugis warriors. Since the emergence of Makasar as an emporium, traders from south Sulawesi became the middle-men in the spice trade from Maluku. Even though Makasar was conquered by the Dutch in 1669, their boats (padewakang), were always able to evade the blockade of the Dutch fleets protecting the mono-poly on spices from Maluku. Apart from trading in spices, the Makasar-Bugis traders also developed into the main inter-island traders in the eastern waters of Southeast Asia. In time two different trade patterns emerged among the Bugis. The first was the `formal trade', using legal passes issued by Dutch authorities. The settlements of these traders in the cities of Maluku, like Ambon, Ternate, and Tidore were known as Kampung Makasar, although a small number of Javanese and Malays also lived there. In Ambon, besides trading, their leaders were used by the government as intermediaries when dealing with Muslim villages in central Maluku. The second pattern was the `informal trade', avoiding the formal trade routes controlled by the Dutch. Those who traded in this way, regarded as `smugglers' by the Dutch, must have been more numerous than those who sailed with government passes. Most of them settled in the coastal area of north Seram which was still unoccupied by the Dutch. Those who settled in the villages on the islands east of Seram (Seram Laut and Gorong islands) had a longer history in the area as they had been visiting there since the early 17th century without the Dutch being able to stop them. The Bugis trade network in the islands of Maluku was an extension of their settlements in various places in the Nusa Tenggara islands such as Bali, Lombok, Sumbawa, Sumba, and Timor. The `informal trade' of the Bugis was important in two ways. First, many traders tended to marry locally and became in fact trade agents for their compatriots who visited the area once a year. Sea products were their principal interest, especially trepang (sea cucumbers) which were much in demand by the Chinese. The second importance of the Bugis presence in the eastern waters was their influence on local culture. The fact that they circulated such `foreign' goods as iron, weapons, textiles, and rice was important to the development of the material culture of the area. Further, the influence of their house styles was strong in some settlements in north Seram. And most importantly, they brought Islam to the marginal islands of Maluku. Although Makasar was controlled by the Dutch from 1669, Bugis traders kept operating from the port city. A group of Bugis from Mandar, for instance, operated as far as Cambodia. 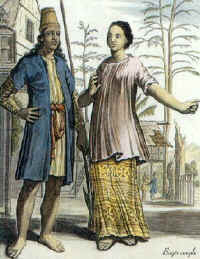 Amanna Gappa, their Matoa (chief) in Makasar, rewrote the maritime laws of Malacca in the form of an elaborate Bugis maritime code. Another trading activity organized from Makasar was the `trepang' trade to the northern coast of Australia. Studies made by historians and linguists point to the fact that many loan words in the local Aborigine languages of the Northern Territory are of Bugis or Malay origin. In particular words denoting kinship, maritime activities, trade commodities, art, ornaments, parts of the body, and flora and fauna are positively identified as being Bugis or Malay.